tunstead, great rocks, limestone trains, peak forest, ICI Limestone trains from Great Rocks/Tunstead featuring D5274 - D5279, 5274 - 5279, 25124 - 25129 & D7586, 7586, 25236 and many others that worked these services. Its April 22nd 1977 as an un-identified Class 25 heads west past Northenden with a train of loaded ICI limestone hoppers. It appears the train is loaded to at least eighteen wagons, approximately 1,250 tons. The geological construction of the northern areas of Derbyshire reveals a dominance of gritstone, shale & limestone. All have their uses, but it is perhaps the quarrying of limestone that has had the most significant impact on this area. One of the earliest recorded users of this limestone were the Romans who uesd it for construction and the making of mortar & cement. The very pure content of this Derbyshire limestone (high in calcium carbonate) had, by the 16th Century made it particularly desireable for use in agriculture, achieved by burning the limestone in lime kilns. It was also used in lead smelting. The Industrial Revolution with its canal and railway building eras allowed for the easier movement of this bulky product, whilst in 1929 Imperial Chemical Industries Ltd focused on the development of a quarry at Tunstead, incorporating a crushing plant and lime kilns. The company was looking to find a reliable source to supply limestone of a high purity to its three high volume facilities in Northwich, Cheshire. The facilities at Northwich date back to the 1870s with John Brunner and Ludwig Mond establishing a factory at Winnington for the production of sodium carbonate, also known as soda ash. In 1926 a similar factory was acquired at Lostock and in 1927 a third factory was opened at Wallerscote. It was during 1926 that Brunner Mond became part of ICI. The Solvay ammonia-soda process, used to create the soda ash required the movement of limestone, ammonia, coke and coal by rail to Northwich, the salt needed was available locally. The ICI Works occupied three locations at Northwich, the Wallerscote and Winnington facilities used a short branch to join the ex-Cheshire Lines Committee via Hartford North & Hartford East Junctions (between Hartford & Northwich station). The Lostock Works, north-east of the station accessed the main line via Northwich yard. The limestone empties would then head east and follow the route through Altrincham to Deansgate Junction and Skelton Junction. The route continued through Northenden and Cheadle, beyond which the trains would take the former Midland Railway route towards Hazel Grove and the lengthy Disley Tunnel. After New Mills South Junction came Chinley then Chinley North & South Junctions. After a short distance came the lengthy Dove Holes Tunnel, the deep cutting at the south (east) end was followed by the site of Peak Forest station and then the quarries and works located at Tunstead and Great Rocks. The summit of the line was between Peak Forest station and the entrance to Dove Holes Tunnel, at a height of 982 feet above sea level. For the loaded westbounds departing Tunstead this required a very brief but challenging three miles, which for the Type 2 locomotives invariably meant the use of a banking locomotive. Once over the summit the descent featured grades of 1 in 90 towards Chinley, the vacuum braked bogie hoppers allowed for improved train control over the previous unbraked mineral wagons. By 1951 1.5 million tons of limestone was being taken out of the ground. Tunstead would become the largest limestone quarry in Europe. Over half of this was for use as aggregate (road & building construction), whilst the bulk of the remainder was consumed by the cement and chemical industries. The ICI limestone trains of the late 1920s & early 1930s used 12-ton mineral wagons, with trains frequently loaded to fifty wagons, the unloading of which was particularly onerous. Midland 4Fs followed by Stanier 8Fs were typical motive power during this era. Steam would handle these services until the early 1960s, whilst during the late 1930s the 12-ton mineral wagons would be ousted by the arrival of new 43.5 ton bogie hopper wagons. Prototypes were delivered late in 1936 with the first production batch completed in April 1939. Increased post-war demand for soda ash saw two more batches delivered in 1947-1948 & 1952-1953. In the early 1980s accident damage claimed thirteen of the original 152 wagons. The ending of steelmaking at Shotton Steelworks on the Wirral saw thirteen replacements acquired from the British Steel Corporation. These wagons, originally built for John Summers & Sons were of a slightly different design, after acquisition by ICI they were refurbished at ICI's Avenue Workshops, Northwich. During 1955 the facilities at Tunstead required urgent repair work, this saw the diversion of one daily train loaded at Raynes Quarry, Llysfaen in North Wales. This was one of the few times that the ICI bogie hopper wagons could be found away from the Tunstead - Northwich route. The quality of the limestone at Llysfaen was similar to that at Tunstead. 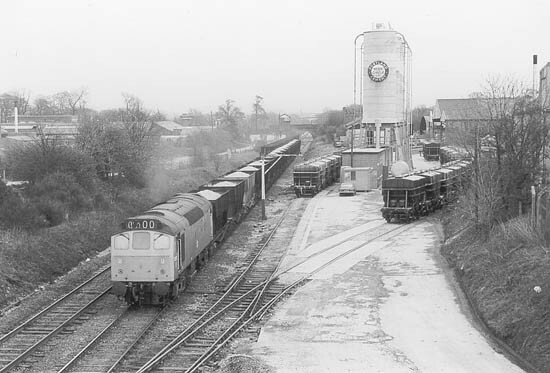 The first diesels tested on these services were trialled in 1963. The Midland line north of Matlock was frequently used for testing new diesels fresh out of Derby Works, with fifteen miles of a 1 in 90 ruling grade north of Rowsley, culminating at the 985' summit at Peak Forest, the cobwebs would certainly be blown out of the diesels. For our story part of this route - the last few miles to the summit - was traversed daily by loaded westbound ICI limestone workings with the majority requiring banking locomotives on this challenging grade. During May 21st - 23rd MetroVick Co-Bos D5711/14 and English Electric Type 4s D227/228 were tested on these stone trains, using rakes of sixteen wagons. Remarkably the MetroVick's were found to be superior, the Class 40s suffered from shifted tires and brake linings. Parts of this route had already seen much diesel activity, though this was principally on the passenger workings over the Derby - Manchester Central route. During February & March D5707 & D5713 returned for further testing, whilst during March D5255 & D7586 were transferred to Trafford Park (9E), presumably to be trialled on the limestone workings. D5255 was transferred back to Toton during April, but D7586 remained allocated to Trafford Park until January 1965 when it was briefly reallocated to the Nottingham Division, but returned to Trafford Park the same month. With the testing completed the decision was made to utilise the Sulzer Type 2s on the limestone trains. To accomplish this seven Type 2s would be allocated to Trafford Park (9E) shed. All the locomotives selected were virtually brand new and had been on allocation to Toton (D16) after delivery from the workshops. D7586 which had been one of the locomotives used in the trials remained at Trafford Park, perhaps an odd choice since the locomotive was boiler equipped. The remainder were D5274 - D5279 and arrived during June & July. For D5274 - D5279 these new locomotives had only been released from Derby Works after they had successfully completed several test runs including one with a set of empty coaching stock. The test was made to Corby and back, D5274 made the run on May 29th 1964, D5275 on June 1st, D5276 on June 9th, D5278 with D5280 on June 10th and D5279 on June 8th. The locomotives did not immediately begin work on the limestone workings, so were able to wander about such as on June 20th when D5279 was noted at Chesterfield with a Saturday's only Paignton - Newcastle passenger, assisting 45597, whilst the next day it was noted with D5260 on an excursion from the Derby area to the North Wales resorts. On August 4th the Class 25s began the arduous workings planned for them, finally taking over many of the duties from Heaton Mersey & Northwich based Stanier 8Fs. Specifically they were employed on the Peak Forest - Winnington ICI workings. These trains employed the venerable vacuum braked ICI bogie hoppers, first introduced in 1937, which were now used in rakes of eighteen (1,100tons), providing a considerable challenge to the single Type 2s. The 8Fs had generally been allowed sixteen wagons (980 tons). For the time being no other freight service in this area was dieselised, another three years would pass before major inroads commenced. The wagons themselves outlived most of the power that hauled them, including the Class 25s. The ICI plant at Winnington was comprised of two industrial complexes, the original plant had been greatly expanded after World War Two, the old (Winnington) and new (Wallerscote) facilities being neatly dissected by the A533 Northwich - Runcorn road. Limestone was not the only bulk product received here, coal, coke & oil were also received by the trainload. Each of the facilities had their own interchange with the railway, traffic for Winnington was routed to Oakleigh sidings whilst Gorstage sidings handled traffic for Wallerscote. Obviously from the other notes in these pages it is Oakleigh sidings which is well associated with the Class 25s & the limestone trains. Photograph courtesy John Ashley. A loaded limestone train rolls westwards through Chinley, date unknown. The locomotive cannot be positively identified, but appears to be one of the original batch D5274 - D5279. On Whit Monday, June 7th D5275 got a brief respite from its ICI workings when it was noted at Blackpool on the 20.15 to Northwich, one of thirty nine excursions to return from Blackpool that day, the majority were steam hauled. No doubt D5275 was available at Northwich for other duties on this holiday, not being needed for the limestone workings. Buxton depot received D5091, 5135/37 for crew training and banking duties at Peak Forest at the end of February. These machines would work alongside the small pool of Sulzer 2's working the Northwich - Tunstead ICI block trains. It had now been three years since dieselisation of the ICI trains and this demanding working had naturally given rise to all too frequent failures. This created an operating headache if steam were substituted because the official eighteen wagon limit for the Type 2's could only be handled by 9F's, other substitutions required doubleheading. Typical of this was the failure of D7586 on April 26th, rescue coming from 8F 48723 & Cl 5 45417. During November D7586 transferred from Trafford Park to Longsight (9A). As the last full year of BR steam closed out Trafford Park still had on allocation twenty one steam locomotives (fifteen Black 5's and six 8F's), alongside the six Type 2's D5274 - D5279. With the impending closure of Trafford Park D5274 - D5279 were transferred to Longsight (9A) during March, whilst in May D7586 went to Leeds Holbeck (55A). On March 3rd Buxton, Northwich & Trafford Park depots closed to steam with 8F's 48744 & 48775 being the last to leave Buxton, having seen much activity locally in their last week at Buxton. During 1968 a new terminal was established by Quickmix Concrete Co. Ltd at Thorpes Bridge Junction (opposite Newton Heath depot), roadstone was supplied from Tunstead in the ICI bogie hoppers. Additional terminals were later opened by Tilcon at Collyhurst Street, Miles Platting and Portwood, Stockport. The latter location was impacted by the construction of the M63 and moved to Bredbury, Stockport. These traffic flows ended in the early 1990s. During May Trafford Park shed was demolished making way for the new Freightliner terminal. And from May 12th the ICI stone trains were no longer operated with a brake van. During May 1971 green liveried 5278 was involved in a serious collision on the single line section between Great Rocks Junction and Buxton. The locomotive suffered considerable damage, being removed to the yard at Peak Forest. It is reported that 5278 had been shut down whilst attached to a train on a grade without the application of the handbrake. Eventually the air or vacuum within the braking system bled off and the train rolled away. After the collision the driver notified Buxton depot by telephone that there was a problem with the locomotive, the shed master suggested sending out a fitter to rectify the problem! So severe was the damage that 5278 was withdrawn in May, remaining on-site until October when it was broken up by G Cohen. This was the first Class 25 to be withdrawn. During the early 1970s occasional trips with the ICI bogie hoppers were made to terminals at Carterhouse Junction, Widnes and Amasco Sidings, Pendleton, from 1974 these workings used Tarmac's own PGA two-axle wagons. During March & April the remaining members of the original batch of 'ICI' locomotives all transferred to Toton (D16), 5279 in March, all the others in April. None of them would return on allocation to Longsight. At this time Longsight had a mainline diesel fleet of almost one hundred locomotives, split almost equally between Classes 25 & 40. Included were the first Class 40's, 200 - 206 and the first Class 25's, 5151 - 5156, any of which could and did turn up on the limestone workings. Frequently locomotives from other sheds would fill in on the limestone turns if they became available at Northwich, Longsight or Buxton. The process by which soda ash was made at Northwich had for many years relied on rail transport to bring in the raw materials. Rail activity at Northwich had peaked in the 1960s, during 1973 the delivery of ammonia from ICI Billingham, Teeside switched over to road transport. As time went on so too would other deliveries to Northwich switch to road haulage. On November 8th ex-works 25210 was tested at Northwich on the Tunstead limestone service, working the 17.21 Oakleigh - Tunstead and return followed by the 02.57 Northwich - Tunstead. It then beat a hasty retreat to Longsight for repairs, not unexpected after dealing with these 1,250 ton trains. Further testing on 28th didn't improve matters, it failed at Hazel Grove on the 11.03 Oakleigh - Tunstead, being removed to Buxton and then forwarded to Derby Works. Whilst motoring up the A6 on February 24th 1980, a foggy Sunday morning bound for a day's adventures in the Manchester area all eyes went right as the form of a derailed train lingered in the poor visiblilty. Taking the first right turn possible (one that didn't require the use of a tracked vehicle) the location of the unfortunate event was soon reached. No locomotive could be found so it is presumed that it was not affected by the derailment. The derailment had occurred on February 22nd west of New Mills South Jct with many of the loaded hoppers sustaining derailment damage including some taking a tumble down the embankment. Eight of them were later moved to Chinley and broken up, it appears the unidentified locomotive involved was not derailed. 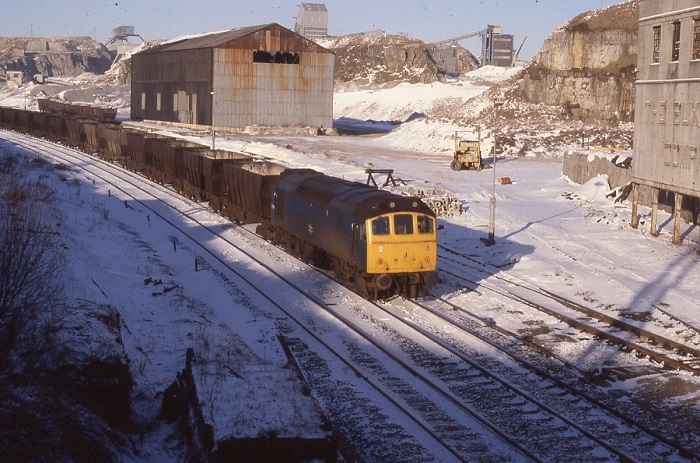 The ending of the Bidston Dock - Shotton iron ore workings early in 1980 made its fleet of bogie hoppers redundant. From this source ICI were able to purchase thirteen wagons to replace those lost in the above derailment and others. Also acquired were many spare parts, particularly bogies. This allowed the Tunstead - Northwich fleet to all run on the same style bogies and all were now roller bearing equipped. A sunny August 26th 1980 finds 07001, now in private owner service, parked up in between duties at the facilities north of Peak Forest station. 07001 was one of the last of the class to be withdrawn, during July 1977. Its previous haunts of Eastleigh and the Southampton area are well removed from its new duties with Peakstone Ltd.
With the Class 25s slated for withdrawal, testing began with pairs of Class 20s on the 'ICI' limestone trains on September 28th-30th. Twenty two hoppers and brake van were worked on the first day, later increased to twenty four hoppers, 20163 & 20196 were loaned from Toton for these trials, which apparently were successful. It was hoped that by increasing the number of wagons per train, one daily roundtrip could be removed. The presence of many Type 4s - Classes 40/45/47 and the smaller Class 37s were regular visitors to the Buxton area freights, so much so that the Class 25s were often completely absent from the area. The month of May saw a dozen Class 31s moved to Longsight, the first allocation of this Class here. Ten of Longsight's Class 25s moved elsewhere on the LMR, allowing for withdrawal of further members of the Class. In a move to replace the Class 25s on the Northwich - Tunstead ICI limestone trains pairs of Toton Class 20s were used during May. To assist this change Springs Branch crews were trained on Class 20s during May, 20181 & 20227 were present at the beginning of May, later replaced by 20211 & 20212. During that last week of May a number of Buxton bound empties ran via Manchester Oxford Road (rather than via Cheadle Heath). The continuing coal miners strike and the ongoing delivery of Class 58s led to many local workings in the North West (and elsewhere) being taken up by the Classes 56 & 58, no doubt having an impact on the use of Classes 25 & 40. One effect of the miners strike was the permanent transfer to road haulage of coke deliveries from Monckton Coke & Chemicals, Royston, Yorkshire to Northwich. Northwich train crew depot closed on November 26th, the work now split principally between Warrington & Buxton depots. The last of the original 'ICI' allocation locomotives, 25236 was withdrawn in December, being stored at Crewe. January opened badly for the Class 40s, all but four of the surviving fleet - all allocated to LMR depots - were consigned to scrap, their place increasingly taken by transferred-in Class 20's, no more would the big Type 4's whistle over Peak Forest summit. 45031 approaches New Mills Central with the loaded 6J32 ICI limestone hoppers on September 11th 1985. Another view from September 11th 1985 finds 20172 & 20173 heading east through New Mills Central light engine, it looks like the light is fading as the locomotives head into the night. This pair of Class 20s were two of the eight selected for working the ICI limestone trains (see note below). Another freight flow to fall victim to road haulage was the almost daily flow of caustic soda from ICI's Castner-Kellner Works at Runcorn. During April eight Class 20s (20023/59, 20134/168/172/173/194/196) were fitted with modified triple valves for handling limestone traffic from Tunstead. In a similar fashion to the Class 25/9's they were renumbered 20301 - 20308. The following month in a major announcement concerning redundancies one of the depot's to be included in the run down was Buxton. The dedicated Class 20/3s returned to their original numbers in October/November with single Class 47's or pairs of Class 37's taking over these turns. Class 31's were now visiting Buxton to cover the banking duties. However on October 16th a set of empties arrived at Peak Forest behind 47378 & 25279, both locomotives were working. For a while in mid-February 20141 covered the shunting duties at Peakstone's sidings at Peak Forest whilst their own shunter received repairs. 1987 was the the last year of operation for the Class 25's. Their final months of the Class 25's were generally spent on covering workings in the North West. One of the final few - 25059 - after spending Monday of that last week at Millerhill, then Carnforth and Crewe (17th), reached Buxton on March 18th where it would be withdrawn (20th). However its work was not quite finished, on the evening of March 24th it was restarted at Buxton to haul damaged 47089 & 37689 to Crewe Works for attention! Ironically it was a similar March day nineteen years earlier that had seen steam vacate Buxton shed forever, now one of the diesel classes which had made that possible was itself being superseded. Although the 'ICI' locomotives didn't operate till the end, at least 25126 existed as one of the hulks at Swindon. It would out live the cutting activities there, and as part of the convoy of 25093, 25126/134/161/164/180/193, 25207/208/260, 25306/327 would leave Swindon Works for Cocklebury Yd and later Vic Berry's Leicester on June 3rd 1987. It was finally broken up during November/December 1987. With the creation of the Railfreight sub-sectors in the late 1980s, a pool of Construction sector Class 37s was allocated to Buxton to handle the limestone trains. These locomotives, operating in pairs, would remain on these services until the PHV wagons were replaced by new stock. During 1987 the ICI quarry at Hindlow closed, but the lime production facilities remained open, requiring pairs of Class 37s to bring in limestone from Tunstead using the ICI bogie hoppers. This required a reversal at Buxton. These workings would continue until 1995 when this service received new air-braked wagons. During 1991 the soda ash business was sold off, the owners continuing under the name of Brunner Mond Ltd.
A year later in 1992 the limestone quarry operations were renamed Buxton Lime Industries Ltd (BLI), resulting in the wagon ownership being transferred to BLI. This change was visible on the wagons as the ICI lettering was removed and the number prefixes updated. By the mid-1990s the vacuum brakes on the wagons were becoming a serious liability as the supply of locomotives that were equipped with train vacuum brakes was diminishing rapidly. The answer would see air-braked PGA two-axle hoppers hired in to temporarily replace the aging hopper wagons until new purpose-built wagons were constructed. The end came for scheduled use of the ICI hopper wagons during the last week of December 1997, after sixty two years of service. The withdrawn wagons lingered in internal service at Tunstead, Lostock & Winnington, eventually being sent away for scrapping between the summer of 1998 and the winter of 1999. At least six reached preservation. On June 29th 1998 a rake of 37 vacuum braked JHV wagons were taken by 47467 to European Metal Recycling, Attercliffe for scrapping, which would commence very quickly. Following the withdrawal of the bogie wagons, Class 60 locomotives took over the services, allowing for increased train lengths and fewer trains. Gone were the day of four to five trains per day, in 1998 the increased payload allowed the reduction from seventeen to fourteen trains per week. New 102 tonne (glw) bogie wagons introduced in 2000 called for a maximum of eleven trains per week from Tunstead, but this was reduced to five per week when the soda ash plant at Winnington closed in 2014. A nicely lit view of 25124 at Springs Branch on January 20th 1978. By this time 25124 is allocated to Toton so its return to Northwich is by chance. Also by chance is the fact that the picture below of 25104 was taken one day after this view - though it looks like the weather is unchanged. On a dull and wet Sunday January 21st 1978 whilst doing a tour of the Cheshire area depots prior to visiting Crewe Works, 25104 was noted parked in front of the old steam depot. 25104 is one of those Class 25's that had its boiler room grille sheeted over whilst receiving repairs at Derby Works. It appears the brazier used to protect the water supply from freezing has gone out. An empty eastbound led by 25043 leaves the Northwich - Old Trafford (ex CLC/MSJ & A) line at Skelton Jct and joins the Glazebrook - Cheadle (ex CLC) line. At Cheadle the train will gain former Midland metals which will be used for the remainder of the trip to Tunstead/Great Rocks. The date is May 14th 1979, 25043 was the last Class 25 in green livery, though by this time it sports 'Corporate Blue' as applied at Derby Works during the early summer of 1976. Its 3.30pm on August 5th 1977 as an unidentified Class 25 - possibly 25198 - approaches Chinley station with another set of empty hoppers bound for Tunstead. An empty limestone train heads eastwards through Chinley on September 24th 1977 behind 25137. At this time 25137 was allocated to Springs Branch. A lengthy train of loaded wagons heads west through Chinley behind 47200 on June 18th 1984. Rationalisation has reduced Chinley station to a bare minimum and only two lines remain. Beeching's axe reduced the once sprawling station at Chinley to little more than a 'paytrain' halt on the Sheffield - Manchester route. The intact platforms here suggest days of a finer grandeur, when expresses from St Pancras connected with locals to??? But now on a dull October 2 1977 a returning set of limestone empties led by 25103 is all that rattles the former glories of the windswept platforms. On a gloriously sunny June 22nd 1977 another train of empties arrives behind 25031. This was a well travelled Class 25, having seen allocations on the ER, WR & ScR prior to reaching Springs Branch in June 1976. Just over a year was spent here, allowing it to cover the ICI trains from time to time. In October 1977 25031 returned to Eastfield, remaining there until withdrawn in December 1977. After the closure of Peak Forest station to passengers the 'Up' platform was eventually demolished, its place partially taken by a number of sidings where 25161 stands on this sunny morning on June 6th 1980. 25161 reveals a typical Derby paint job, though at some point the Works have sealed up the boiler room grille, carried out on a number of Class 25's overhauled at Derby. At the time of this photograph 25161 was allocated to Crewe. Peak Forest lost its train service from March 6th 1967 but some of the station buildings still remain. Here Longsight allocated 25106 eases by with a train of covered hoppers on June 22nd 1977. It is easy to forget that this line once hosted the original 'Peaks' (D1 - D10, Class 44) and the Blue Pullmans. On June 23rd 1977, an apparently glorious day in the High Peak, a train of empties led by 40111 eases past the giant shadow created by buildings belonging to the Buxton Lime Company. A few minutes earlier the train had been running through the notorious Dove Holes Tunnel. After a short layover 40122 draws onto the main lines to make up its next train of stone hoppers. During August 1963 Longsight based 227 & 228 were tested on the stone trains, being loaded to a maximum of sixteen wagons, however it would be seven Class 25's that were used the following summer to dieselise the ICI company trains. Despite the presence of a typical Derbyshire misty morning, very little can mask the sound of a pair of Sulzer six cylinder engines getting to grips with another Winnington bound train of limestone. Here, on April 24th 1979 Longsight allocated 25208 echoes around the limestone cliffs that surround Great Rocks Junction, soon to be followed by another Type 2 pushing hard on the rear. Behind 25208 lies the ICI 'South' shops. On a gloriously damp April 24th 1979 45035 uses the crossover at Great Rocks Jct. Whilst dodging the many raindrops here a gung-ho security person advised that photographs were not permitted here. This being a marked public highway, with a number of marked footpaths crossing the local scenery, we were somewhat amused by the statement. In the end it was the Derbyshire rain that sent us on our way, leaving the security person to keep an eye on the suspicious looking sheep in the nearby fields. 40182 and a short freight drift down from Peak Forest past Great Rocks Jct on April 27th 1979. To the right of the locomotive used to be a small yard complete with turntable for servicing steam locomotives. During the last week of May 1981 Tony made a visit to the North Derbyshire area, principally to photograph the Class 76's working over the Woodhead route. A couple of side trips were made to Great Rocks & Peak Forest to capture the various stone train workings. Despite the wonderfully liquid North Derbyshire early summer weather, Tony persevered long enough to capture a number of hard working Class 25's on workings that they had covered for sixteen years. In the first three views from May 28th 1981 25274 & 25308 are seen at Great Rocks Junction in the process of lifting eighteen loaded wagons, on extremely damp rail, to the 980' summit just beyond Peak Forest station. Despite the damp air one presumes the surrounding Derbyshire hills echoded mightily to the sound of these two locomotives as they got to grips with their train. The left and center views show the train passing the Great Rocks workshops, the right view shows the banker pushing hard as the train heads up the hill towards Peak Forest. The crossovers just visible in the left & center views next to the leading Class 25 mark the end of the double tracked line. The former Up (left) line leads to Buxton, the former Down line, holding the limestone train is a siding south of this point, leading to the ICI (Lime Divison) Tunstead Works and its extensive array of sidings which end at milepost 161, just short of Peak Forest Tunnel. In the right view the banking locomotive is passing over Great Rocks Junction, the train is on the Up goods, to the right is the Down goods, and to the left is the Up & Down through siding. It appears this through siding is out of use in a number of these views and that where it rejoins the Up line at Peak Forest South Signal Box, there are a number of track panels stacked up on the siding. At the time of these photographs 25274 was allocated to Bescot and 25308 was allocated to Toton. (Three views below) Now situated on the overbridge alongside the former Peak Forest station Tony waits for another loaded limestone train, this one led by 25320 and banked by 25308, in charge of twelve wagons. Its still May 28th 1981 and it looks like the rain is still coming down. Within a mile the summit will be reached and then its into the blackness of the lengthy Dove Holes Tunnel. The three views above reveal that even in 1981 there was a considerable amount of trackwork and sidings in place, including some complicated, expensive to maintain pointwork, no doubt left over from a previous era. Visible in all three views above is Peak Forest South Signal Box, behind the box, to the right are the BR Sorting Sidings, whilst facing the box to the left are the Down Sidings. Two views from May 26th 1981 with 25274 in charge of eighteen empties leave the deep cutting north of Peak Forest (left view) and then is seen drifting downhill towards Great Rocks Junction (right view). The rusty sidings in the foregound were once part of a small facility established to service the steam locomotives that once plied these rails. The clouds are still foreboding but the rain has held off, so far! The left view, from May 26th 1981 shows 25320 marshalling wagons at the loading facility north of Peak Forest. The right view shows 25320 approaching Great Rocks with a train load of empties, crossing from the Up to Down main prior to entering the Works sidings. A weak sun has broken through the storm clouds at the right moment for the photographer. And what became of those original limestone 25s? 7586 had moved away to the Eastern Region in May 1968 and 5274 - 5277, 5279 to Toton during March & April 1972. Their places were taken by a great variety of other Class 25's & 40's from a variety of depots. Until the delivery of the ICI bogie wagons, deliveries of limestone to Northwich was by 12ton mineral wagons in train lengths of up to 50 wagons. Unloading was a very manual process requiring uncoupling of individual wagons at the tippler, securing the wagon to the tippler prior to discharge. Late in 1936 three 43.5 ton prototypes were delivered from Charles Roberts & Co. Ltd, Horbury for evaluation, they were numbered ICI 3200 - ICI 3202. After a succesful evaluation period deliveries resumed in July 1937 with the first order completed by April 1939. Key characteristics of the new wagons were their ability to carry at least three times more limestone than the 12.5 ton mineral wagons, the new wagons could be emptied in minutes and did not require uncoupling from the train. Finally the wagons were vacuum braked, providing for much better train control on either side of Peak Forest summit, especially for the loaded westbound workings. There were detail differences between the batches. The first three wagons had different handbrake mechanisms, the handbrake on ICI 3000 was fitted as a handwheel mounted in the center of the underframe, this was the design chosen for all future orders, the other designs fitted to ICI 3001 & ICI 3002 were replaced by the handwheel type. Additionally the first three wagons were lettered 'ICI Ltd', the 'Ltd' was later omitted. The original batch of wagons were fitted with bogies of a diamond frame, later batches were fitted with a plate frame. During the 1980s the diamond frame bogies were replaced with plate frame types from withdrawn BSC iron ore hoppers. The later batches of wagons were fitted with larger 'ICI' lettering on their sides. The 1952 - 1953 build featured a slightly modified rib design on the side which had the door control. This provided more room to operate the door return levers. During the 1960s the open fronted plain bearing axle boxes were replaced to accommodate roller bearings. For a short period between 1985 & 1986 ICIM 19000 was equipped with airbrakes, it reverted to vacuum brakes at the end of the testing period. General repairs were carried out every seven years at ICI's Avenue Workshops. During the early 1980s thirteen wagons (19024/35/46/59/68/79/89/96, 19102/18/35/40/43) were condemned due to accident damage (New Mills South Junction 1980, Hartford North Curve 1981, Chinley South Junction 1981). These were replaced by thirteen wagons acquired from British Steel Corporation following the closure of the Shotton Steelworks during March 1980. These wagons would be renumbered 19152 - 19164. Although not actually involved with the allocation of the locomotives that worked the limestones trains, the location of Buxton & Northwich, at each end of the line, saw them frequently visited by the limestone train locomotives for fuel & water and for minor repairs. Both the depots were of a modest size and located close to each town's passenger station. Northwich was a holdover from the steam era, of brick and concrete construction and designed for the handling of steam locomotives. Buxton however had a modern depot, purpose built for the servicing of diesels the railcars. 25313 poses for its portrait on June 27th 1981 by the fuelling point in front of Buxton shed. 25313 spent its entire career allocated to LMR depots, and would remain in service to the very end of the Class 25 story. The exhaust of 25202 stains the fine blue sky of a glorious Derbyshire morning sometime in January 1982. The ploughs seem a case of overkill for the depth of snow on this day, but anyone who has driven the A515 Ashbourne - Buxton or the A6 as it crosses the moors in snowy weather will know that the wind can create some immense drifts out of what seems to be only a little fall of snow! After the Class 25's were replaced in 1984 by the Class 20's, who in turn gave way to the Class 37's, the look & feel of Buxton depot changed somewhat. Seen here sometime in 1988 is a multitude of Class 37's led by 37687, with just one Class 47 present. A glorious day in July 1975 finds 40013 'Andania' at Northwich. The Longsight based Class 40's were equally at home on the limestone workings. Another dull and damp Sunday afternoon visit to Northwich finds a pair of Class 40's parked alongside the shed. Leading this duo on December 19th 1976 is 40130, one of twenty equipped with split headcode boxes either side of the gangway doors. Steam has been gone for almost ten years, yet still an atmosphere lingers on this damp January 16th 1977. Parked at the end of the shed are ex-works 40177 and 25138. After Trafford Park closed Longsight became responsible for providing locomotives for the ICI workings. A surprise visitor on November 10th 1979 was 25071, recently transferred from Cricklewood, and once a regular sight on the Royal Train workings. A path ran down the side of the steam shed to the 'administration block', behind which on November 10th 1979 sat 40093. The destination for many of the limestone trains was the ICI plant at Winnington, a suburb of Northwich. The old steam depot served as a signing on point after dieselisation, the shed remained standing until the 1990's. Seen here on April 11th 1980 is 25039 laying over between turns. Time marches on, along with it changes to most everything. For the 'ICI' services limestone continues to be extracted from the Derbyshire hills, trains still run, but (as of 2003) there is only one daily service to Winnington. After the Class 25's departed from the services their replacements included Classes 20, 37 & 47, followed later by the newer Classes 60 & 66. And as the locomotives changed so did the company names. British Rail virtually disappeared into a myriad of private companies and liveries. In 1997 ICI sold its interests in the limestone processing to a new company that resurrected the name Brunner Mond & Company. The Winnington plant was heavily rationalised, its only rail traffic now being limestone. An EWS locomotive handles the train throughout, Oakleigh sidings are no more, traffic passes through the former yard on a single line and is handled via a new tippler on the Brunner Mond site, also gone is the extensive internal railway systems of Winnington/Wallerscote. The more modern facility at Wallerscote was closed and raised to the ground making way for new housing, also closed and removed was Gorstage sidings. Avenue Works, responsible for maintenance of the ICI facilities also took care of the venerable vacuum braked bogie hoppers, these Works still remain although no longer operated as part of Brunner Mond's facilities. Northwich shed and the expansive railway sidings are now gone, the shed demolished, making way for further housing, part of the site becoming a car wash! None of the the original seven Class 25's allocated to Trafford Park survive, all were cut up. However at least two of the bogies hoppers reached preservation and can be found on the Severn Valley Railway. Following the end of the iron ore service between Bidston Dock and the BSC Works at Shotton in early 1980, the surplus wagons allowed ICI to replace those lost to accidents over the years. The thirteen replacement wagons allowed the creation of a pool of wagons for fine aggregate flows to depots in the Manchester area. The views below possibly feature some of these workings. An unidentified Class 25 with a set of empty wagons passes Romiley Junction signalbox on an overcast June 16th 1974. The train is coming off the Hyde Branch and will be heading eastbound towards New Mills, Chinley & Great Rocks. With a string of twelve loaded hoppers in tow 37074 heads west through Guide Bridge on June 6th 1980, destined for one of the receiving depots in the Manchester area. An unidentified Class 25 with a loaded stone train is on the 'Up Slow' and heading towards Miles Platting/Manchester Victoria. The train will be braking for the 20mph restriction for the curve at Miles Platting. The station in the background is the closed Park station and Park Station signal box, the railway coming in from the right is the Ardwick branch. The photograph may have been taken from Park No.1 box. The train is probably destined for Colleyhurst Street sidings. Class 45 No. 45058 and six ICI wagons heads along the old Cheshire Lines Committee line to Tiviot Dale. The location is in the vicinity of Tiviot Way as Thomas Storys crane/Meadow mill and Lancashire Hill flats are visible. Most likely the working was to take stone to the Tilcon plant that used to be on Brewery street. At least two of the ICI bogie wagons reached preservation, Nos. BLI 19000 & BLI 19036, TOPS code JGV-N.
One of the preserved bogie ICI limestone wagons can be found in the NRM Annex at Shildon, seen here during June 2009. 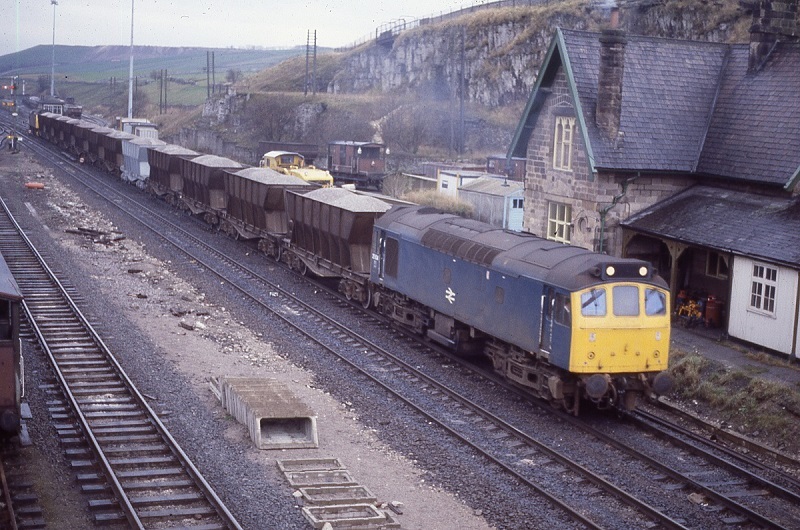 25138 29/03/1976 eastbound Chinley empties? 25196 01/09/1978 westbound loaded Guide Bridge. Last updated September 11th 2018.